Why does the world need yet another book on how to write fantasy fiction? Because the public continues to show a nearly insatiable desire for more stories in this genre, and increasing numbers of aspiring authors gravitate toward writing it. As our real lives become more hectic, over-scheduled, insignificant, socially disconnected, and technologically laden, there seems to be a need among readers to reach for a place where the individual matters. Where people form bonds of friendship and camaraderie that are tangible and face-to-face around campfires in unfamiliar forests and on long, dangerous quests instead of through abstract tweets and selfies posted on Facebook pages. Fantasy—whether traditional, epic, urban, or humorous—offers a place where the ordinary person can meet challenges and become extraordinarily heroic and significant. Or, the misfit too awkward and shy to succeed with the home crowd finds that he or she is in fact someone very special, with amazing powers that are exactly what’s needed to save the day. Fantasy is, in fact, a comforting place—no matter how dangerous the plot may be for its characters. It gives anyone—most especially the reader—a chance to be heroic. It drew me in originally because its detailed, unusual settings and spirit of adventure delighted my imagination. As a child, I read tomes of mythology, folklore, and ancient history in addition to Andre Norton, Edgar Allen Poe, Ray Bradbury, Alexander Dumas, and Robert Heinlein. When I grew older, I gravitated toward the historical fiction of Georgette Heyer and C. S. Forester, plus John D. MacDonald and Dorothy Sayers. All these writers, while producing divergent work, nevertheless evoke vivid locales and unusual characters. Those qualities continue to draw me to any author of any type of fiction. While reading voraciously is vital for all writers, I think it’s important not to be too narrow. Fantasy—old and new—of course needs to be read, but do reach beyond researching magical creatures to explore other types of fiction and classical literature. Read anything that generates a better understanding of human nature and the motivating force of human emotions. I think writers of traditional fantasy need a solid grounding in history, battle strategy, politics, mythology, anthropology, and the classics, and I think writers of urban fantasy should acquaint themselves with a wide range of thrillers, mysteries, and noir films. In addition to the lure of setting and adventure, I also love how open fantasy is to exotic, unusual characters and creatures. There are very few boundaries in this genre. Nearly anything is possible—and permissible. That sort of creative freedom is one that I revel in as an author. I think, however, that the creation of setting can be something of a tar pit for inexperienced writers. Often, they begin by creating their own special world and populating it in their imagination. They devise elaborate histories, character backgrounds, languages, and magic systems—everything, in fact, except a plot that offers more than a random series of misadventures for the characters. However amazing it is, the setting of any fantasy story is only one aspect. There must also be a strong, well-thought-out plot and vividly designed characters that act from understandable and sympathetic motives. Setting alone will not carry an idea very far. The fantasy fiction formula therefore addresses the craft of writing, the nuts and bolts of how stories are first imagined and then assembled in order to give readers a wonderful time. It demonstrates the techniques that hold plots together from start to finish. It is intended to work in creative writing courses, yet it serves also as a guide for any aspiring writer. It can be followed step-by-step and chapter-by-chapter, or it can be studied randomly in any order preferred. Beyond craft, it is intended to boost a new writer’s self-confidence, because as the techniques of fiction are mastered, imagination is freed to become more creative than ever. Not only does this book help writers to improve their stories, but it also shows them what to do when their stories veer off course. 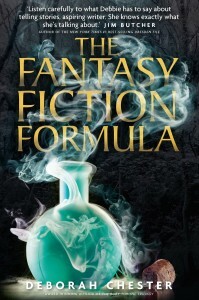 The fantasy fiction formula is available now.